The first week in September is the one time of year when Rondeños really let their hair down and everything comes to a stop for the week long party known as the Feria de Pedro Romero. IMPORTANT: If you want to stay in Ronda to experience the feria and all it has to offer then don’t delay in booking your hotel. Use the booking form to the right as soon as possible! Places will already be limited! 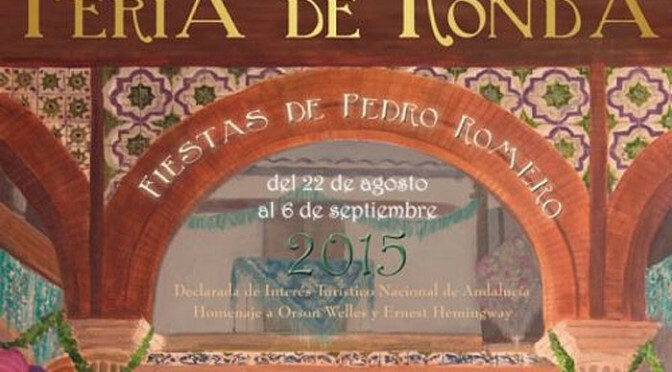 There is a full program of event (in Spanish) here and the dates of events are on page 45. Most of the streets surrounding the Plaza del Socorro become pedestrian only as bars bring their kegs and counters into the street for the hordes who want to party. The last two days of the feria coincide with one of the highlights of the Spanish bullfighting calendar, the Corrida Goyesca. The exhibition ground on the outskirts of Ronda pounds to the sound of party music, children of all ages go crazy on dodgem cars, ferris wheels, and all sorts of other amusement rides. The streets of Ronda are adorned with paper lanterns in bright colours, so many in fact that La Bola, Ronda’s main shopping precinct, actually appears to have a fake ceiling. Back in 1954, one of Ronda’s most famous bullfighters, Cayetano Ordóñez, developed the brilliant idea of combining the bicentennial anniversary of the birth of Pedro Romero, a Corrida, the town Feria, and the art of Francisco de la Goya into a single week of pageantry. His son Antonio, known locally as ‘El Maestro’, then managed the event, and due to his friendship with Orson Welles, catapultd the event into the international arena. 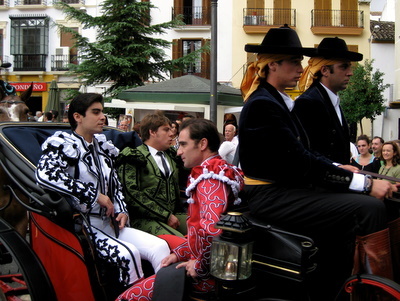 Goya’s art is brought to life when the citizens of Ronda dress in a style reminiscent of the magnificent costumes of the period as painted by Goya. The men wear outfits with short jackets, very straight pants, and wide brimmed hats. The ladies all wear gowns in pretty satins and lace.